If you’re going to run a business, then you should know how important it is that you learn everything that there is to know about your competition. There are always going to be other businesses who deal in the same products and/or services as yours and you want to gain the competitive edge against them. 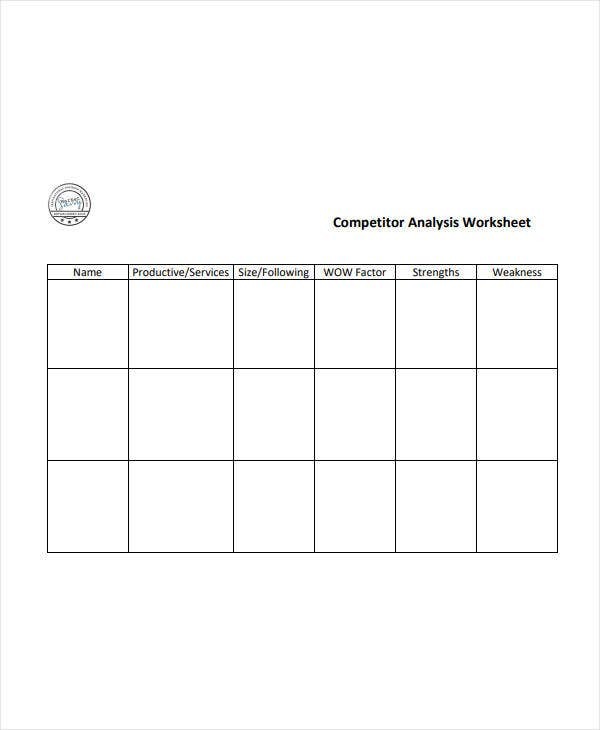 You can also like competitor SWOT analysis templates. And that’s only going to happen if you’re able to gather as much information on them as possible. 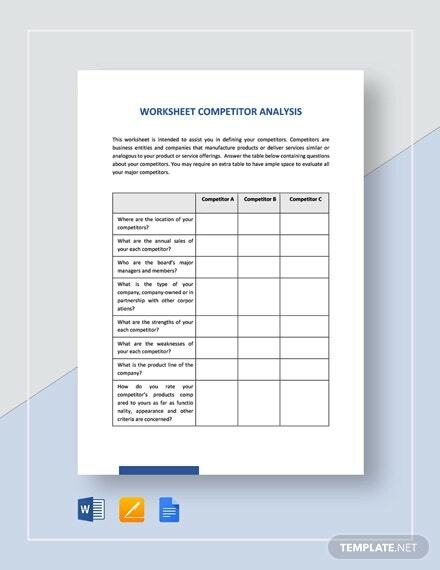 Which is why this article is going go to teach you all that you need to know about a worksheet competitor analysis and how you’re going to make one. you may also see Analysis Templates. 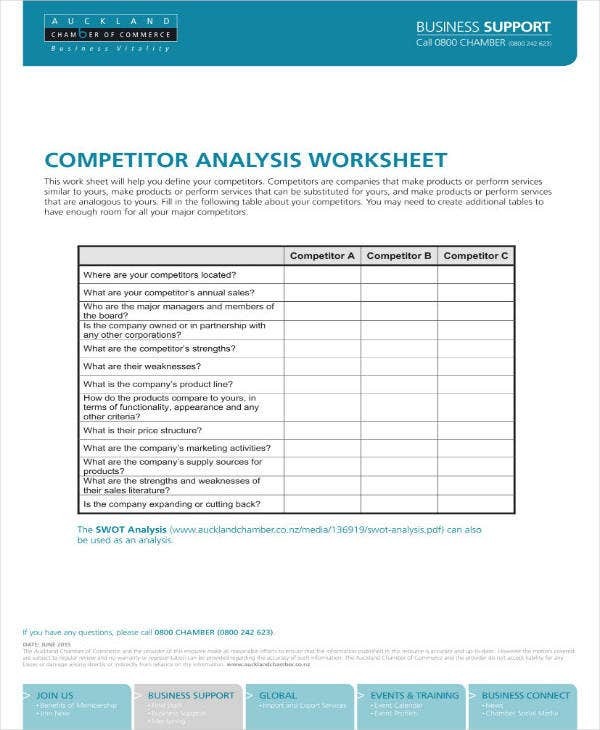 Remember that the entire point of this tool is to help you better understand the other businesses that you’ll be competing against. The more information that you have on them, then the better you can come up with strategies that will help you get ahead of them or aid you in maintaining your edge. Although this will take up your time and possibly a couple of your resources, you’ll find that you won’t regret conducting one. 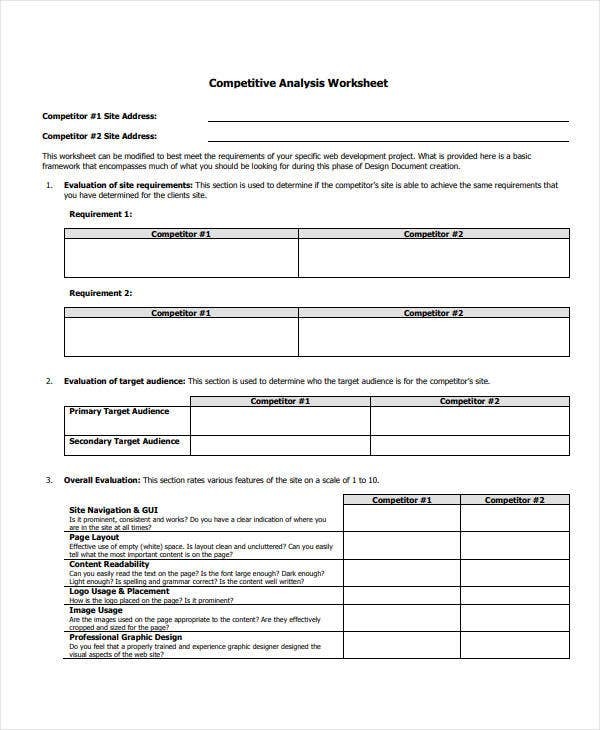 You can also read sample competitive analysis templates. 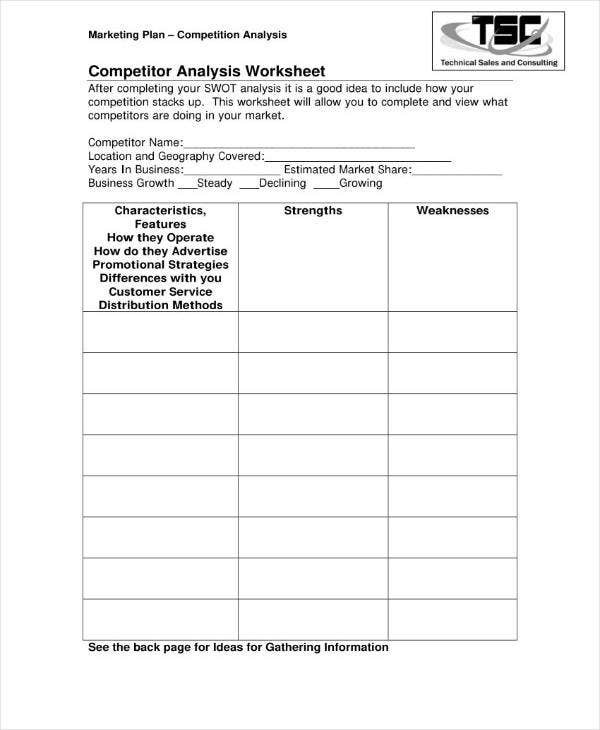 The first step when making the worksheet is to understand who your competitors are. You want to list down the businesses that deal in the same products and services as yours as they’ll be your direct competition towards the path to success. You can also like customer analysis templates. Although, you can also go with the option to list down only those that you see as the biggest threats. You’ll also want to take note of the businesses that don’t exactly deal in the same type of business as yours, but ones that are aiming for the same customer capital. And lastly, you want to keep an eye on the companies that are going to be entering the market that you’re in within the coming year. 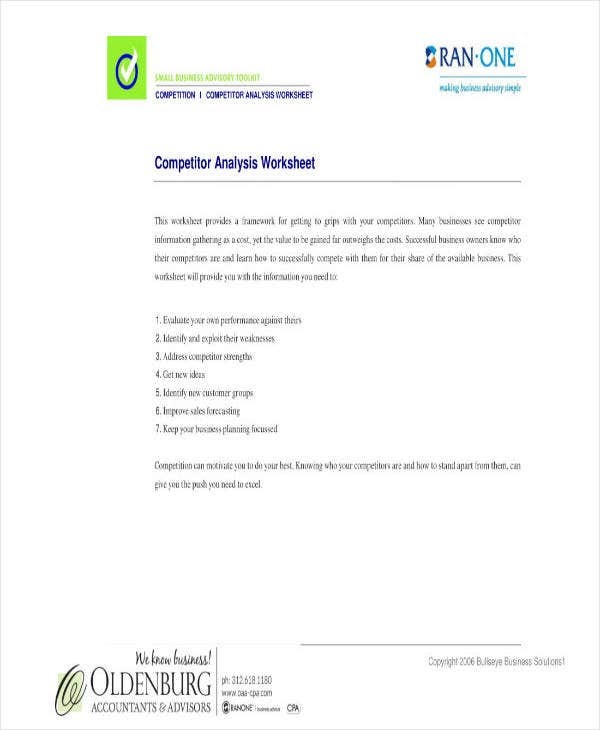 You can also read customer analysis sample templates. There are so many ways in which you can come up with the list of the businesses that you’ll be facing off against. Ultimately, it’s your decision on how you’re going to assess who your business’s biggest threats are. Once you’ve been able to finalize your list, it’s best that you highlight the businesses that you think are going to pose the biggest challenges and who you think are going to be your biggest threats. You can also read industry analysis templates. The next step in the analysis is for you to take a good look at your competitor’s products and services. That way, you’ll be able to understand the means in which your competitors are able to sell to their customers, as well as understand why people are willing to buy from them. You can also read market analysis templates. When it comes to understanding your competitors’ products and services, you’ll need to know why they mean so much to their customers. The first step in doing that is to see what features they offer. What is it that they do that keeps customers coming back for more? 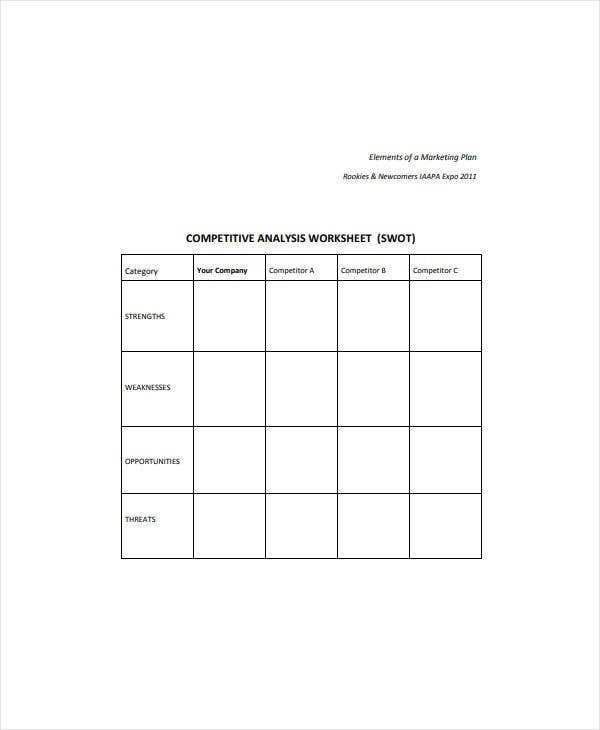 You can also like company analysis templates. Next is to understand what kind of value they’re being offered at. How much are your competitors selling them for? How many customers buy these products and which ones in particular prove to be the ones that are purchased the most? You may also like product analysis templates. And lastly, you’ll want to know who these products and services are being targeted to. Is your competition aiming towards selling their products and services towards a specific audience? Or are they selling them to just about anyone? 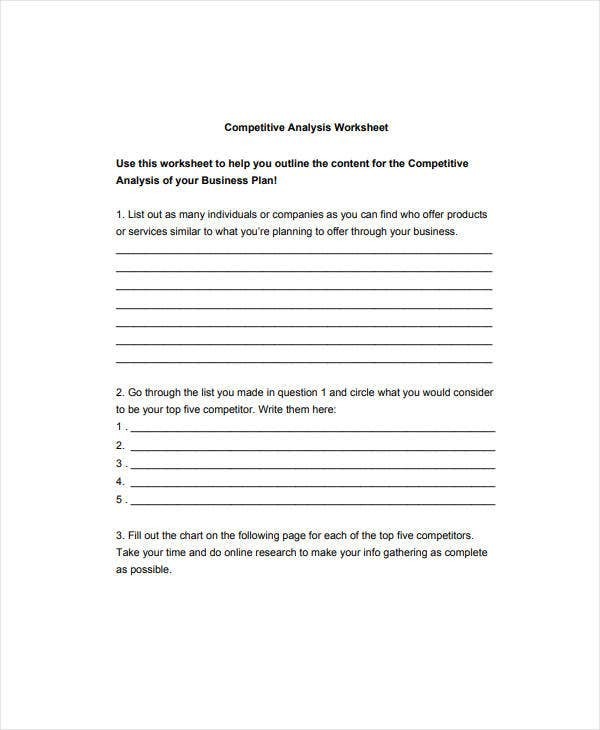 You may also read business analysis templates. These are questions that you’ll need to answer if you want to have a good understanding as to how customers feel about your competition. One of the best ways to gather this type of information would be to look at how your competitors are marketing what they have to offer. Do you think that their marketing strategies are helping them get their customers? Is it possible that you should be doing the exact same thing? 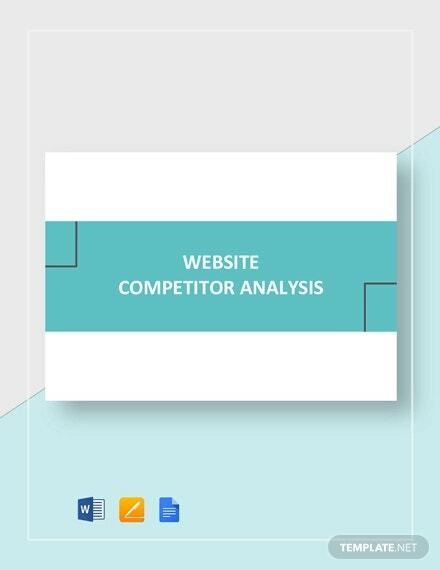 If you want to learn about the other ways in which you can acquire information regarding your competition’s products and services, then you can always take a look at our other examples of SWOT analysis articles here on our site. If you’re going to list down both the strengths and weaknesses of your competition, then you have to do so objectively. It won’t do you any good if you allow bias towards your own products and services as that will just end up in clouding your judgement. You want to look at what your competition offers with the eyes of a customer. What is it that your competition offers that you know you really like? What is is that you think that they have problems with. Don’t think of yourself as their competition, but rather as someone that wants to see whether you would like to do business with them or not. You can also read analysis templates. If you want to be able to gain information on their weaknesses and strengths, then there are many methods in which you can do so. One of the easiest would have to be the ability to use the internet. With it you can figure out everything from how your competitors are marketing what they have to offer via their website—assuming that they have one—or how their customers view them via review sites. 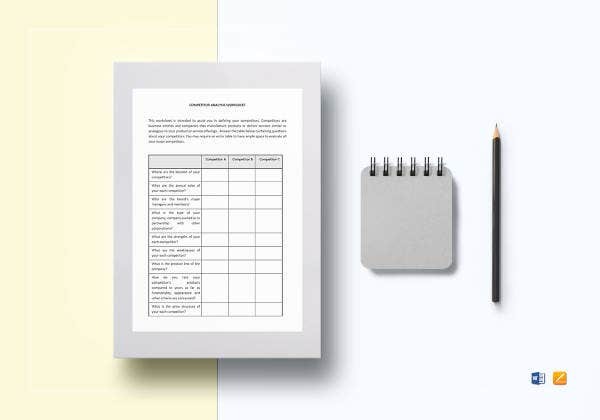 You may also like requirement analysis templates. Don’t just rely on the internet to gain access to this information as there are many ways for you to get it. You can go with the direct route by going up to customers and asking them how they view your competition. You can even conduct surveys where your customers can answer anonymously. You can also read financial analysis templates. The reason as to why you would want to learn about their strengths is because you may find that you can use it against them. Or maybe knowing the information can help you come up with your own strategy that’s much fitting for your business, and ones that outshines that of your competition. You can also see sales analysis templates. As for learning about their weakness, you’ll want to do it because you need to see if your own business carries the same problem. You can learn a lot from knowing about the mistakes you competition has made. Doing so can help you prevent the same issues from happening to your business. You may also see printable project analysis templates. You need to figure out what it is that your competitors are aiming for. That way, you’ll be able to see if it’s in direct conflict with yours. In the event that it does, then you’ll want to do everything that you can to ensure that your competition isn’t able to stop you from achieving your objective. You can also see cost analysis templates. And one of the best ways to do that is by knowing what kind of strategies they’re going for. So what you’ll need to do is to see what kind of marketing strategies your competitors are using. Is there anything that they’re doing in particular that’s making customers want to come to them? Do you think that the sample marketing strategies they’re using are ones that will help them gain the edge against your business? Also, what kind of sales projections do you think your competitors have? While you’re gathering all of this information, make sure that what you do get are only facts. And once you’ve figured out what their strategies are, then the next step is to come up with the ways in which you can counter them. You may also read organizational analysis templates. Before you do anything, you need to understand the state of the market that you’re in. Is it still growing? If so, then you won’t have to worry as much about your competition as there will still be customers left to go around. But let’s say that the market has fallen flat and that there’s no longer any room for growth. This can only mean that the competition is going to be fierce as every business is going to try and establish dominance over the area. And if you see that the market within your area is falling apart, then it’s best that you relocate your business to a place that’s more profitable. You can also read gap analysis templates. If you’ve settled down on a location, then you’ll have to see what the latest trends are. What is it that your customers are looking for? Do you think that your business will be able provide them with what they want? Is it possible you should consider changing what your business has to offer Figure this out and you should be able to stabilize your status in the market. 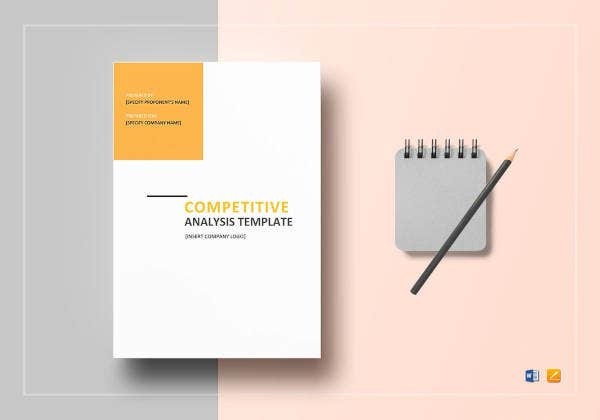 You may also read data analysis report templates.